Doctor Ben's "How-To #3: Weathering & Painting Using Pigments"
There are lost of folks who offer powders and say that they are for weathering models. Unfortunately, they don't explain what they are and how to use them. Although Doctor Ben's has only offered the "dry" weathering pigments for the past ten years or so, the Doctor Ben's Industrial Weathering Pigments have been a key ingredient in the Doctor Ben's Weathering Solutions & Stains for more than thirty years. 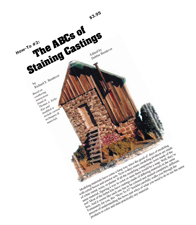 This Blog Post is the complete Doctor Ben's "How-To #3: Weathering & Painting Using Pigments" booklet in digital format. 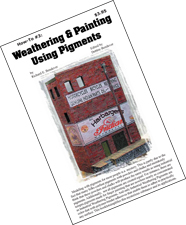 The information in this How-To booklet will provide amazing results when using Doctor Ben's Weathering Pigments, but may not be as effective when trying to use "weathering powders", because, well, they're just not Doctor Ben's. 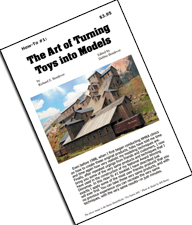 Modeling materials have come a long way since the good ol’ days of modeling with cereal boxes and erector sets. Now-a-days many modeling products are made of white metal, resin, or plaster all representing brick, stone & wood. If all the modeling components were made of the same material, figuring a way to color or stain them would be a snap. Well, they're not and we help explain how to make them look realistic in this How-To booklet. Even before 1988, when I first began conducting NMRA clinics on how to create these original products, folks have told me time and time again how very realistic my modeling techniques are. Finally, after repeated urgings from friends and customers, I now bring you some of the very same products and techniques that I have used in the construction of my National Award Winning Dioramas. In this How-To #1 booklet I have described just exactly I apply some of the most user friendly products that you will ever find. You can take these very same products, and with no previous experience you can recreate the very same techniques, with the very same results—in just minutes.